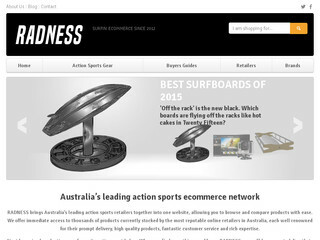 Radness is Australia's leading shopping comparison website for bodyboards and bodyboarding accessories. From the homepage of Radness, you can choose either to search or browse through the entire range of stock from all of the top online bodyboard shops in Australia, from the convenience of one simple website, radness.com.au. We can save you time, money and the hassle of seaching countless websites to find the best bodyboarding gear at the best available price in Australia. Visit the website of Radness.com.au |Compare Prices of bodyboardshops in Australia now ! Radness.com.au |Compare Prices of bodyboardshops in Australia , belonging to category "Bodyboard Shop"